Female hand washing a dog. Funny york terrier being bathed. Female hands washing small dog. 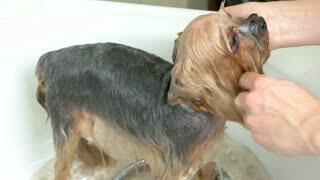 York terrier in bathtub. Female hands washing cute dog. White maltese taking bath. 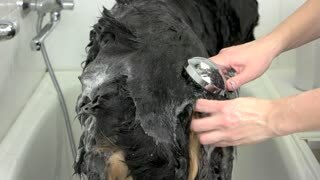 Dog hygiene basics. Dog bathing in slow motion. Wet york terrier. Female hands, dog grooming. Groomer cutting fur, york terrier. 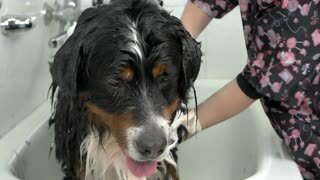 Bernese dog being bathed. Hands washing dog, shampoo. Bernese mountain dog, bathing. Woman washing a dog. York terrier and female hands. Cute dog in a coat. Female hands washing dog, shampoo. Animal taking bath, close up. 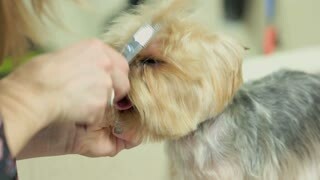 York terrier grooming, female hands. Dog getting a haircut. Female hands washing dog. Funny york terrier in bathtub. Hypoallergenic pet shampoo. 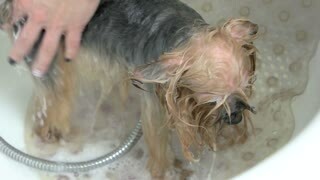 York terrier being bathed. Female hand and wet dog. Big dog taking a bath. Hands washing pet.